Domestic helpers have been making the news in Singapore. But for the wrong reasons. In June 2016, a domestic helper was arrested after her employer was found dead in their house at Telok Kurau. 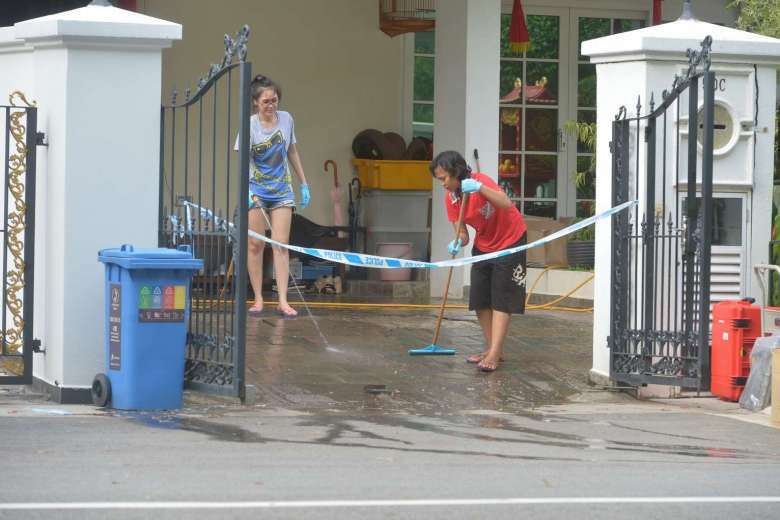 A lady and one of the maids (in red) washing blood stains off the porch floor at 50C Lorong H Telok Kurau on June 8, 2016. There seems to be an increase in the number of violent incidents involving domestic helpers. We took to the streets to ask people if they’d still hire maids in future. Sentiments seem mixed. Perhaps there should be some form of orientation to educate domestic helpers about the help available to them (like Centre for Domestic Employees and Humanitarian Organization for Migration Economics) so if they do face difficulties and stress, they have somewhere to turn to instead of cracking under pressure and committing a heinous crime. Just to be aware. Hire helpers with a good background and also go with maid agencies to have hire the best cleaners in town. Now a day finding a trut able maid is so difficult we g=have checked all he background of our employe maids you feel free to hire them with out any worries.